"I started in 1944, during the Japanese time, and I'm still around. Napagdaanan ko na lahat—vaudeville, stage show, radio, television, movies...lahat! Kami ang unang Japayuki, Bayani [Casimiro] and I. We performed in Japan in 1951," Dolphy said in his birthday interview with Philippine Star columnist Ricky Lo. It's hard to break into showbiz with its stellar cast of celebrities. One must first toil at small roles, which is so much harder if a male wannabe takes the dance route. Guys who dance for a career in showbiz are rare. Usually, they initially aspire to be a model, hoping to get the big break with a hit commercial. But being gifted with lightness of foot is different beat. When people recognize it, they applaud and bring the talent up to the spotlight. PEP gives you the guys who were first discovered for their dancing prowess. Moreover, with their good looks and mass appeal they have made their way into the hearts of Filipino fans. The King of Comedy began his showbiz career during the Japanese Occupation in 1944. Then known as Rodolfo Quizon, he was a stage performer in the 1950's at the Manila Grand Opera House. He was the front act to stage actors like Katy Dela Cruz, Chichay, Pablo Virtusio, Bentot and Pogo and Togo. Eventually he formed a partnership with the late Bayani Casimiro, who was well-known for his tap dancing skills. Rodolfo Quizon's big break came when he danced alongside more popular stars like Pancho Magalona in films by Sampaguita Pictures. 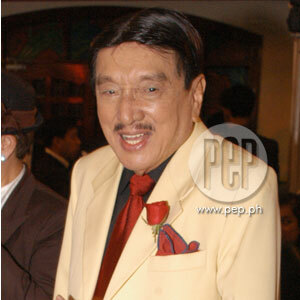 Doctor Jose Vera Perez christened him "Dolphy" and gave him supporting roles. Although thin, pale and sickly looking, Dolphy could really dance alongside some of the biggest stars like Tita Duran, Gloria Romero, and Susan Roces. He even became Luis Gonzales's sidekick. Dolphy's popularity grew when he did television in the ‘60s. He was paired with Panchito in Buhay Artista. He would also be seen as ‘John' in the long running sitcom John and Marsha with the late Nida Blanca. He was lately known as 'Cosme' in another long running sitcom Home Along Da Riles on ABS-CBN. The Comedy King will be seen again in another ABS-CBN teleserye entitled Utoy with Makisig Morales. Dingdong Dantes began his showbiz career when he was nine years old, appearing regularly in several print and TV commercials. His mestizo features appealed to the advertisers. Dingdong's next phase in showbiz was when he became part of the all-male group, Abztract Dancers, founded in 1995 by Zay Villavert. The group was formed as the popularity of the Universal Motion Dancers was at its height. They appeared regularly in television shows like Eat! Bulaga and the defunct That's Entertainment. In 1997, Dingdong was introduced as part of the second batch of TGIS (Thank God It's Sabado). As the character Iñaki Torres, Dingdong was well received by fans of the show, especially when he co-starred with Antoinette Taus, with whom he had a real-life romance. He went on to make movies and also appeared in other GMA-7 shows. In 2002, Dingdong was given the lead role in the primetime drama series Sana'y Ikaw na Nga, opposite Tanya Garcia. Network executives did not miss out Dingdong's hosting talents. He was chosen to emcee a few Binibining Pilipinas pageants and later on he co-hosted the reality-talent search Starstruck. The biggest break for Dingdong came when he was chosen to play the role of Sergio in the hit primetime drama series, Marimar. The past year, he was chosen as Cosmopolitan's top bachelor, besting more than a hundred eligible bachelors. Dino's showbiz beginnings run parallel to that of Dingdong's. Dino began in showbiz with the dance group Abztract Dancers. He also became part of batch two of the hit teen show, TGIS (Thank God It's Sabado). He also appeared in the television shows, Anna Karenina and Sana ay Ikaw na Nga, and in the movies Honey My Love So Sweet, Ikaw Lamang, and Dahil May Isang Ikaw. In TGIS he was paired up with Kim delos Santos as one of the love teams, together with the Dingdong-Antoinette team-up. Dino and Kim eventually got married. But conflict arose in their marriage and the two are now separated. People attribute the downward spiral of Dino's career to turbulent quarrel he had with Kim. However, Dino bounced back and was part of the successful cast of GMA-7's Bahay Mo Ba ‘To? where he played ‘Canor'. He is also part of the very successful primetime series Marimar where he plays ‘Antonio', best friend to Dingdong's ‘Sergio'. The popular host and comedian was discovered by director Chito Roño when he was just 16. Vhong was one of the house dancers for Equinox, a popular Makati disco in the '80s. "Nagma-Michael Jackson na ako no'ng elementary. And then, high school naman ako, sumasali ako sa mga fiesta, mga dance contest. Pero may dance group na ako no'n. Dancer ako sa isang mobile disco. Nagbubuhat ako ng mabibigat na speaker na malaki pa sa akin. Gano'n lang buhay ko noon," he shared with YES! magazine. For the next six years, Vhong honed his acting abilities by playing bit parts and supporting roles in various films like Separada (1994), Istokwa (1996), Labs Kita...Okey ka lang (1998), Daddy O! Baby O! (2000). It was for Spirit Warriors that Vhong was given a big role. Director Chito Roño, who also acts as his manager, recounts, "Actually doon siya pumutok. Na finollow-up naman ng Star Cinema no'ng maging sidekick siya kay Robin at Claudine for Star Cinema [Oops, Teka Lang... Diskarte Ko 'To! ], which also was a big hit. Pumasok ang Got 2 Believe. Ayun, parang sunod-sunod na 'yon. Got 2 Believe hanggang sa Jologs, then of course 'yong Spirit Warriors 2. 'Yong first lead niyang role kasi was with Bayani Agabayani, Cass & Cary, for Violet Films, which made a lot of money." Vhong has morphed into various characters that were identified with him, like Mr Suave, Gagamboy, Agent X-44, and more recently as Lastikman on television. Vhong did not leave dancing behind. He led the the 2004 dance craze "Pamela," followed by "Totoy Bibo," "Don Romantiko," and the latest, "Boom Tiyaya Boom." When Jhong auditioned for Streetboys in 1993, he admitted to director Chito Roño that he couldn't dance. Jhong demonstrated his mastery of acrobatics and breakdancing just the same and won his way into the famous dance group. "Sa Equinox pa ginagawa ang auditions that time. Kaya ako, kailangan ko pang manghiram ng pantalon para lang may maisuot sa pagpunta ko doon, pati sapatos. Year 1993 'ata 'yon. Ang mga barkada ko talaga ang may gustong sumali, pero sa ending, ako ang nakapasok at nakuha," Jhong told PEP (Philippine Entertainment Portal) in an interview last April 2007. Aside from dancing for shrieking fans, the group also ventured into films. One was the 2000 film Spirit Warriors. But Jhong would be later noticed for his acting talent. He did choice supporting roles in the movies Muro-Ami (1999) and Bagong Buwan (2001). Television work also came his way. He hosted the paranormal show Spirits and the action-adventure series Rounin on ABS-CBN. Jhong was also one of the lucky Filipino performers to land in the musical Miss Saigon, where he met his wife Michelle. At 30, Jhong apparently has no plans of slowing down in his artistic career. He plans to put up a dance school for children. And he's also set on directing films and music videos. This 26-year-old actor was a late addition to the Streetboys. But the good looks of the former "Mr Pogi" winner of Eat! Bulaga was not to be bypassed. Danilo was also part of 2000 Metro Manila Film Festival entry Spirit Warriors, the movie that featured Streetboys. From then on, Danilo found good exposure with choice movie roles. He appeared in Cool Dudes (2001), Yamashita: The Tiger's Treasure (2001), Dekada '70 (2002), Spirit Warriors: The Short Cut (2003), Magnifico (2003), Lastikaman (2004). Danilo made a TV comeback in Lastikman, which stars fellow Streetboys performer Vhong Navarro. His projects before Lastikman were television shows like Spirits on ABS-CBN and Daisy Siyete and Pinakamamahal on GMA-7. Danilo is in a relationship with Viva Hot Babe Jaycee Parker. Wowie began his showbiz career with the now defunct song and dance group of the 90's, the Universal Motion Dancers (UMD). But before that he was already part of a smaller dance group he had formed during his teenage years. Wowie was already being noticed as an actor with potential. He was paired with Judy Ann Santos in the popular television drama, Mara Clara. He later appeared in several movies, most of them opposite Judy Ann Santos. But the Wowie-Judy Ann love-team hype died down. She was paired with other male lead stars. Wowie struggled with the demands of show business. His last television work was for Esperanza in 1997. Movies came few and far between. In 2003, Wowie decided to fade out of showbiz and go to the klieg lights of theater. He starred mostly in productions by Gantimpala Theater Foundation like Florante at Laura, Ibong Adarna, El Filibusterismo, Noli Me Tangere, and Alikabok. Having learned the rudiments of theater, Wowie's attempt to make a showbiz comeback began with his appearance at the birthday concert of Judy Ann last year. The comebacking actor has been recently seen in ABS-CBN's new primtime series Kung Fu Kids where he plays Waldo, a policeman-father to Lembot, Jairus Aquino's character. The 32-year old actor is thankful for the opportunity to return to the spotlight. The other half of the popular "Kimerald" love team had his humble beginnings as a backup dancer to Joross Gamboa. It was Jun Reyes, the manager of Joross, who discovered the 17-year-old Filipino-American in September 2005. Gerald was just one of the varsity players for his high school in General Santos City. Jun persuaded Gerald to join Fab Boys. But frustration set in when he saw that Gerald's dancing skills needed some improvement. "Sabi ko, ‘Sige, tuturuan kita sumayaw.' Siyempre, sumakit ang ulo ko, pero sabi ko, ‘Matututo din ‘to, kasi magaling pumick-up ng step'. ‘Tapos, 'yon, natuto naman," Jun said in an interview with YES! magazine. Pinoy Big Brother Teen Edition then beckoned and Gerald wound up as the third placer. Soon, more projects followed and his tandem with PBB Teen Edition winner Kim Chiu gathered fanatic followers. They have been featured in ABS-CBN productions like the sitcom Aalog-alog, teen show Go Kada Go, and the teleserye Sana Maulit Muli. They've appeared in movies as well: First Day High and I've Fallen for You. Gerald's dance skills were highlighted when he was given his own dance album, Gerald's Dance Picks and Gerald Noodle Dance, which was released during his birthday last summer. Joshua was a regular dancer for the defunct GMA-7 noontime show Lunch Date. On the side he was working as cashier and bartender in a club. But he got called in to join OctoManeuovres to replace some founding members of the group. His brother Jason had earlier been auditioned to join the group. In 1987 and 1988, the group performed with Gary Valenciano in his widely successful concerts. In 1989, the group signed with Genesis and changed their name to Manueovres. With the group's rising fame, Joshua and his brother became the center of attraction. It was enough to earn them a shot in the movies. The group appeared in the Gary V. starrer Hataw Na! Joshua on his own became part of Radio Romance (1996), Ama Ina Anak (1996) and Nagmumurang Kamatis (1997). Joshua later appeared on television shows like 1 for 3, Daisy Siyete and occasional tv guestings. Joshua's romantic love life is fodder for the showbiz beat as he is linked to Sexbomb dancer Jopay Paguia. Other stars who were back-up dancers before they had their share of the limelight include Lee Robin Salazar, Michael Flores, and Spencer Reyes.